By the early 1930s, Mennonites were moving from rural areas in British Columbia (BC) and western Canada to Vancouver, British Columbia. The leadership of the Conference of Mennonites in Canada decided to send Elder Jacob H. Janzen from Ontario to Vancouver in 1935 to help organize a Mennonite congregation in the city. Jacob and his wife Elisabeth also helped to establish the Mary Martha Girls' Home to assist young Mennonite women who had in many cases been sent by their families to the city to earn income for the family. Services began in 1935, and the First United Mennonite Church (FUMC) was formally organized in 1937 with 11 charter members, the first Mennonite Church in Vancouver. By the end of the 1940s circumstances produced a total change. World War II had ended and jobs were plentiful. Hundreds of Mennonite immigrants came to BC and many worked in Vancouver and the church filled up. In the summer of 1955 the congregation sold their church building on 49th Avenue and purchased a larger church building on 659 East 52nd Avenue. The congregation continues to worship at the same location, with the building having endured a couple of smaller renovations and one major renovation in the early 1980s. 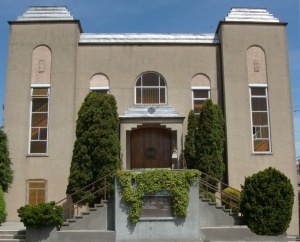 During the early 1950s, the Mountainview Mennonite Church (formerly Vancouver Mennonite Mission) was built and a number of members who preferred English services transferred there. The Sunday school started a missionary project in Richmond and eventually a church was built -- Prince of Peace Mennonite Church. Membership in the church continued to grow and by 1965 Sherbrooke Mennonite Church was built and a new church body was organized in 1967. All three daughter congregations received both members and financial support from FUMC. First United Mennonite and Sherbrooke operated as one until 1968 when the latter became fully independent. From 95 members in 1950 the membership grew to exceed 500 members in the 1960s and 1970s and into much of the 1980s. The 25th anniversary (1962) records 550 members and a 50th anniversary in 1987 saw some 500 members. In 2010 membership was 270. During the 1960s there were many growing families involved in the congregation. The Sunday school numbered in the hundreds and there was a vibrant Boys Club running as well. In 1986 a Spanish congregation was established; in May 1992 this congregation became a member of the Conference of Mennonites in British Columbia as the First United Spanish Mennonite Church. With many young people leaving the city for the suburbs, the membership has declined in recent years. The makeup of the church has also changed. There is still a core group that has been at the church since the early 1950s and there are a number of young adults and new immigrants to Canada who also attend. Current ministries include a partnership with six other South Hill churches to provide ESL classes and an ESL "ALPHA" class through Kingcrest International Neighbours. FUMC also partnered with a number of local churches to establish and run the Place of Refuge, a transition house for persons with addictions. In June 2018 the congregation changed its name to Peace Church on 52nd as part of an effort to respond to changes in its local community. Canadian Mennonite (24 November 1961): 26. Churches in Profile. Clearbrook, BC: Conference of Mennonites in British Columbia, 1978: 99-103. Dueckman, Amy. "New Identity for Vancouver Church." Canadian Mennonite 22, no. 20 (22 October 2018): 13. Harder, Henry. "A Short History of the Origins of the First United Mennonite Church, Vancouver, British Columbia." Research paper, Canadian Mennonite Bible College, 1976, 12 pp. Mennonite Heritage Centre. Information bezueglich der Vereinigten Mennoniten Gemeinden in British Columbien: Gelegentlich der Konferenz der Mennoniten in Kanada, 1959. Abbotsford, BC: The Conference, 1959: 7. Mennonite Reporter (24 June 1996): 12. Mennonite Heritage Centre Archives, Winnipeg, MB: Volumes 109, 1010, 2780, 2928, 3390, 3539, 4441. Goossen, John. "Peace Church on 52nd (Vancouver, British Columbia, Canada)." Global Anabaptist Mennonite Encyclopedia Online. February 2016. Web. 21 Apr 2019. http://gameo.org/index.php?title=Peace_Church_on_52nd_(Vancouver,_British_Columbia,_Canada)&oldid=162250. Goossen, John. (February 2016). Peace Church on 52nd (Vancouver, British Columbia, Canada). Global Anabaptist Mennonite Encyclopedia Online. Retrieved 21 April 2019, from http://gameo.org/index.php?title=Peace_Church_on_52nd_(Vancouver,_British_Columbia,_Canada)&oldid=162250. This page was last modified on 25 October 2018, at 18:54.